ADDENDUM: The film’s juxtaposition of depictions of the gold plates, followed by the story of Jesus’ visit to the Nephites in 3 Nephi 11, followed by Joseph telling his family stories of ancient American civilization conveys a false understanding through an inaccurate sequence of events. The depiction may easily be understood by viewers that Joseph translated the plates, learned the story of Jesus coming to America during translation, and then related it to his family, a sequence of events that did not occur. As FAIR openly admits and even argues, Joseph told stories about ancient America to his family prior to his receiving the plates, as documented by his mother. These stories were “information that he was receiving from the angel Moroni” (FAIR) and not from the text of the Book of Mormon, which had not yet been unearthed, let alone translated through the peep stone and urim and thummim. While the film doesn’t assert that Joseph’s stories were actually from the Book of Mormon, the sequencing suggests it. This could be remedied by simply adding the words, “Before obtaining the plates, Joseph was given knowledge by Moroni or another angel of an appearance Christ himself made… (etc. )” Addition of this qualifying detail will prevent viewers from incorrectly understanding that Joseph told the Book of Mormon story found in 3 Nephi 11 to his family at age 17. Since there is no documentation that Joseph related the story of 3 Nephi 11 to anyone at age 17, the film could more correctly state that Joseph related certain cultural aspects of ancient America to his family in story and not extrapolate further, unknowingly. More concerning, though, the film actually mislead viewers in this regard, for it specifically extols the details of 3 Nephi 11 (relating the account of Jesus’ visit to the Americas with such details as the calling of apostles, invitation to the crowd to touch the marks of the nails, and the miracles Jesus’ performed among them — JOINTLY told with visual material from film “The Testaments,” which depicts the event exclusively as it is told in 3 Nephi) and immediately thereafter using the pronoun “this” to allude precisely to what Joseph allegedly told his eagerly-listening family: “Joseph could describe this as if he had spent his whole life with them.” The pronoun in the sentence directly modifies the story of Jesus’ visit to America. This exaggeration and misrepresentation of the documented record takes literary license and tells a history that is not documented, This can be easily corrected by full disclosure of what is actually documented: Joseph told stories about ancient American war, religion, animal travel, etc. to his family during the years prior to his obtaining the plates presumably from angel Moroni (the historical accuracy of certain aspects of these stories lack substantive evidence by modern investigation [FAIR]). Further information than this, stated or implied, is admittedly unsubstantiated and should be addended for historical accuracy. Joseph’s story need not be embellished for millions to cultivate faith in it, but such embellishment will certainly prevent many members from sustaining their faith. The current depiction incorrectly leads viewers to the understanding that the Book of Mormon story found in 3 Nephi 11 was told to Joseph’s family directly 3 years before Joseph ever received the plates. Furthermore, the telling of these stories confirms that many of the descriptions of ancient America later found in the text of the Book of Mormon were known to Joseph years prior to the book’s translation and publication, which is said to have occurred in a short span of a “three-month period between April and June of ,” (LDS.ORG) demonstrating that the cumulative understanding communicated in the book evolved or was acquired over a much longer period of time. This entry was posted in Book of Mormon Historicity, Book of Mormon Translation, Joseph Smith the Man and tagged Film and Video, Joseph Smith The Prophet of the Restoration, Media on September 3, 2014 by claytonbhess. ADDENDUM: Although the film dramatizes the visit of the angel Moroni as an unprovoked and surprising event to Joseph, historical context adds substantially to one’s understanding of the event and must no longer be omitted in correlated church materials and film depictions. FAIR acknolwedges that Joseph was not at all unfamiliar with messages of valuable relics buried in the ground and the pursuit to unearth them. In fact, he was intimately familiar with seeking for buried treasures and had not only been minimally involved with J. Stowell in treasure seeking, but had been seeking for buried treasure with a seer stone for years, often as his principle employment. A subset of the general population at the time believed firmly in the reality of divination, seer stones, and magical thinking, etc., so it is appropriately argued that the mindset was a not-unheard-of component of early New England history. Often stories of such fabled treasures included treasure guardians, in the form of ghosts, devilish minions, animals, etc. FAIR acknowledges this as foundational history and affirms that, given Joseph’s involvement with treasure seeking, that there is no way to know whether Joseph first considered Moroni (whom he initially described as being the spirit of the Almighty) as one of these treasure guardians, as a divine messenger, or both. Regardless, as modern members of the church consider the story of Moroni’s visitation and the discovery of the golden plates, each has a right to be presented the full contextual history, without having to wade through an occult historical record alone, and to be given such context by the same trusted church organization that first introduced the story to them and sanctified it in their hearts. Members and investigators can still choose to believe that God used Joseph as an instrument to obtain and translate the plates, but such belief should be coupled by understanding of the historical truth. This will likely modify the current pervasive characterization of Joseph and may require mental rationalizations of history, including, for example, that his treasure digging was divine preparation for unearthing the plates, that prior encounters with fictitious treasure guardians was a heralding of the actual divine encounter with Moroni, or that those he led to believe in his magical-world capabilities of divination and seer stone use were correct to believe him and that he alone among 19th century treasure seekers actually held divine seer powers which were later necessary for translation , etc. Omission of such detail has created generations of believers whose faith is mal-contextualized. Modern church members have a right to inform their individual, collective, and generational decisions of faith and orthodoxy with history that is fully disclosed. 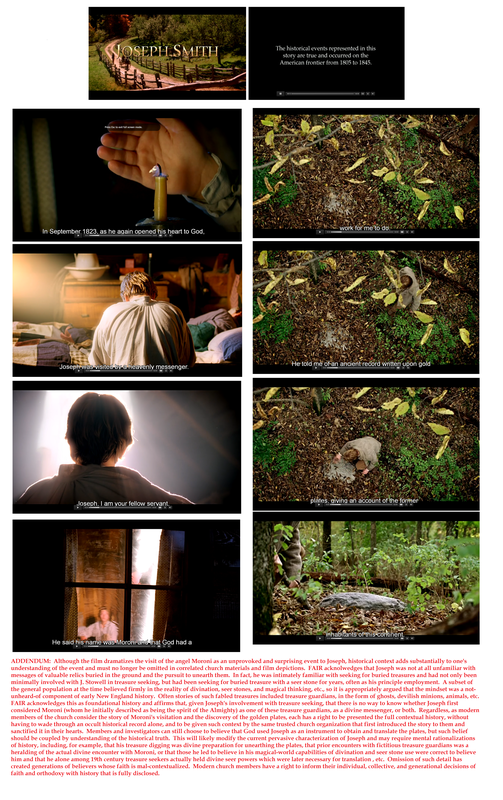 This entry was posted in Book of Mormon Historicity, Joseph Smith the Man and tagged Film and Video, Joseph Smith The Prophet of the Restoration, Media on August 20, 2014 by claytonbhess. 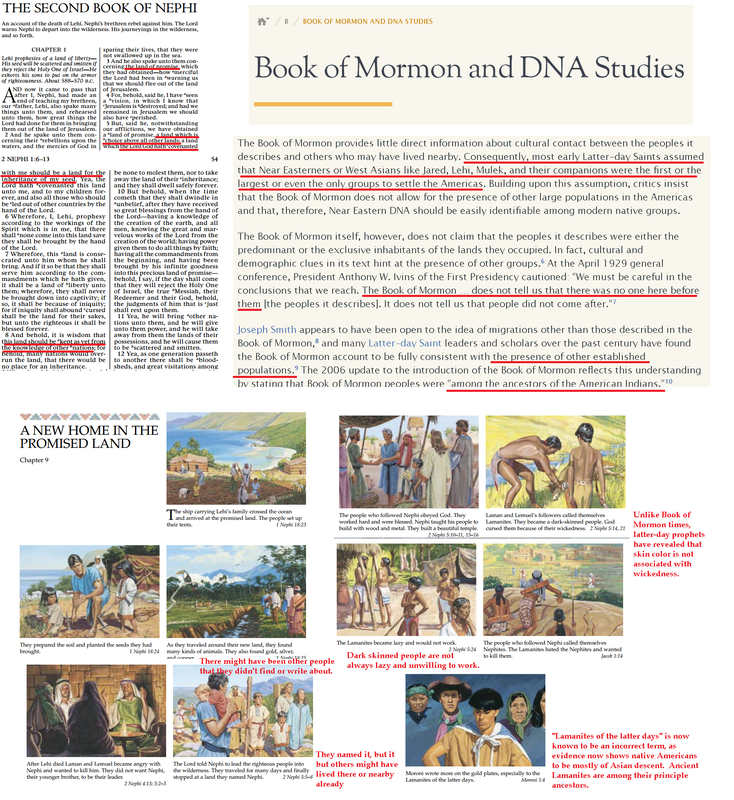 This entry was posted in Book of Mormon Historicity and tagged Book of Mormon Stories, Book of Mormon Stories Chapter 9, Manuals, Primary on July 16, 2014 by claytonbhess.